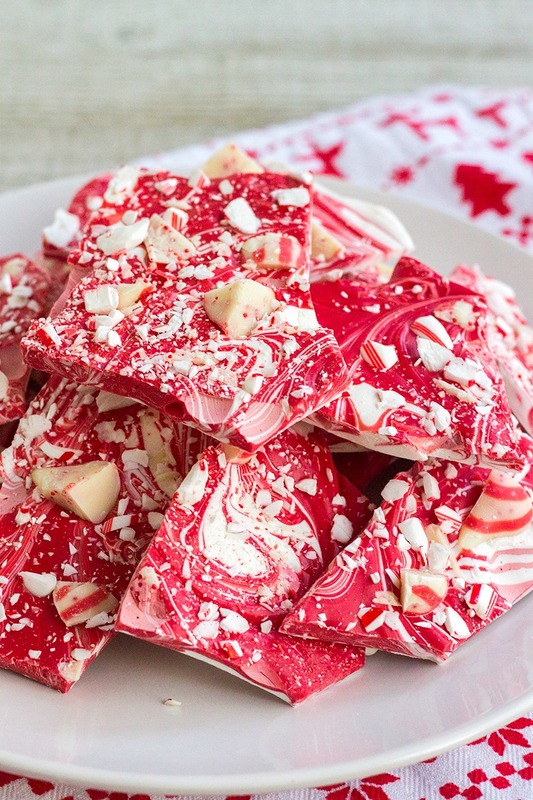 Festive Peppermint Bark is a holiday favorite everyone loves! 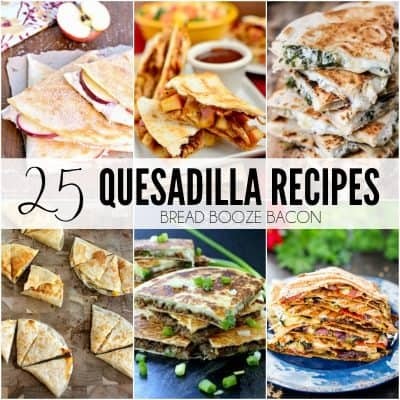 Easy to make and great as a food gift for neighbors or friends! Peppermint is one of my favorite winter flavors. It’s not just for Christmas! The fresh minty flavored pair with chocolate, cookies, candy, cakes, hot chocolate, and more is just so darn crave-able! It’s not only the minty flavor I crave, but the red and white color combination of happiness! How can you not be happy when you see red and white candies calling your name? I’m sure the Grinch can, but not us normal people! 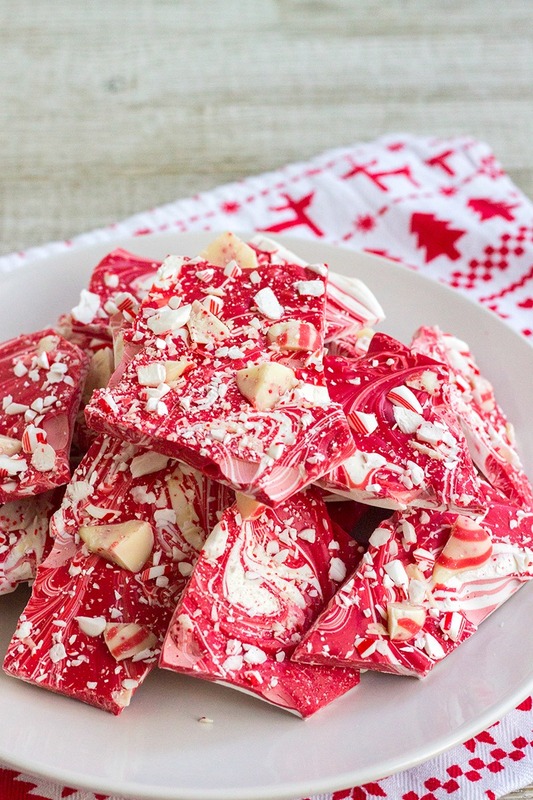 This peppermint bark recipe is crazy easy to make! Ready? Here we go! Heat candy melts until melted. Pour candy onto a baking sheet and swirl together. Sprinkle the top with peppermint candies. 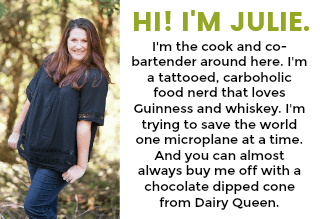 Chill, break, and try not to eat the whole pan by yourself! Boom! 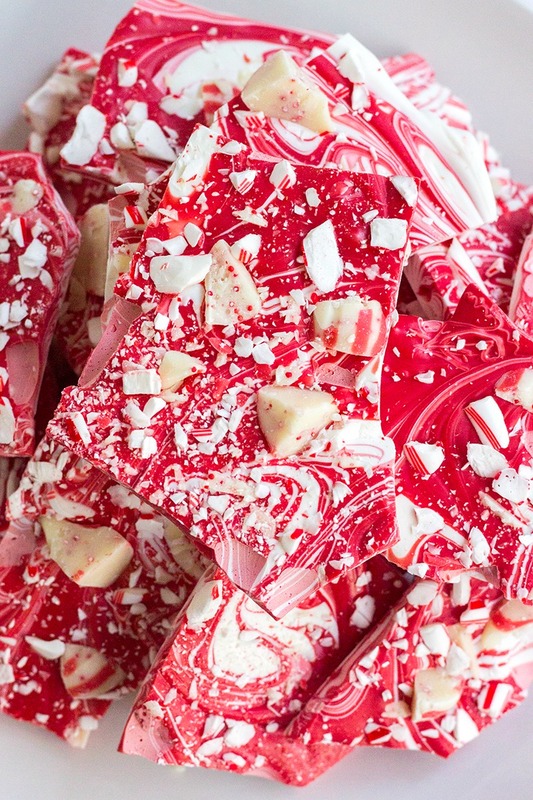 Pretty peppermint bark candy that’s great for giving as a Christmas food gift, serving up at your holiday party, or keeping on hand for a sweet winter treat! 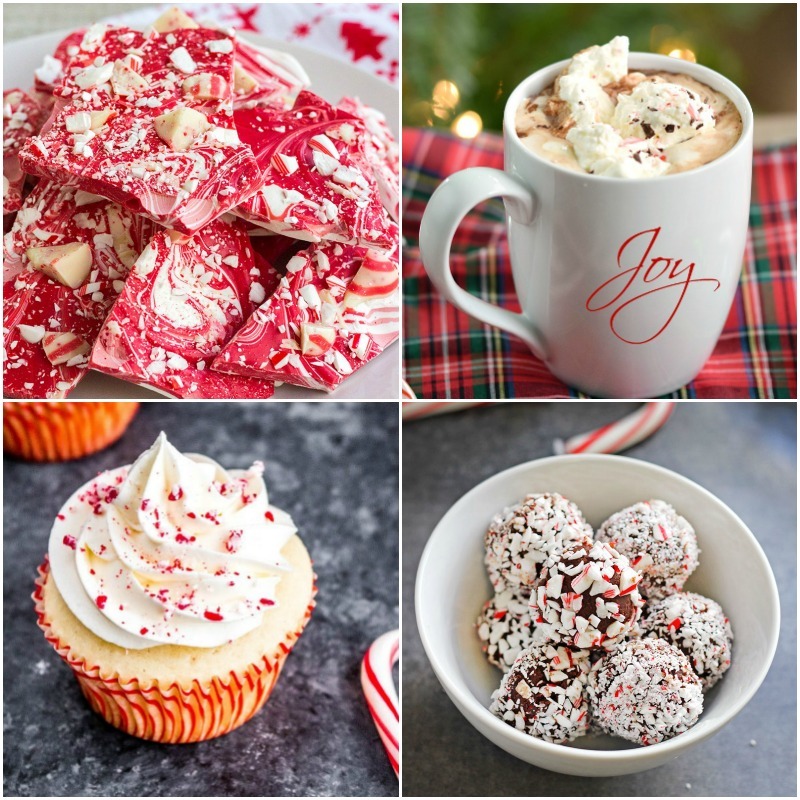 With Christmas in the air, we couldn’t of anything better to dive into for this month’s feast & devour post than peppermint. These seasonal recipes will satisfy all your mint cravings and brighten your day! Place white candy melts into a microwave-safe bowl. Heat for 1 minute. Stir candy melts, and heat again for 30 seconds. Repeat heating for 30 seconds and stirring until candy is melted and smooth. Repeat process with red candy melts. To the red candy melts, add peppermint extract and stir until completely combined. Drizzle big lines of white candy melts all over the baking sheet. Repeat with the red candy melts so the candies over lap a bit and fill in most of the gaps on the baking sheet. Use a butter knife to swirl the candy together until there are no gaps in the candy. Sprinkle the top of the bark with candy canes and chopped kisses. Refrigerate bark until set, about 1 hour. Remove from the fridge, peel off the paper or mat, and break into medium-sized pieces using your hands. Store in an ai-tight container in the fridge until ready to serve. You'll want to chop the peppermint kiss candies fairly small. I cut mine in thirds and they were trying to fall off the bark when I broke it apart. If you want more chocolate flavor in your bark, melt 2 cups of dark chocolate chips with 1 tablespoons vegetable oil. Spread the dark chocolate over the baking sheet before topping with the candy melts. Proceed as directed.